Hotel for Dogs is a 2009 American family comedy film based on Lois Duncan's 1971 novel of the same name. The movie, directed by Thor Freudenthal, was adapted by Bob Schooley and Mark McCorkle (both of Kim Possible fame) along with Jeff Lowell. The picture stars Jake T. Austin, Emma Roberts, Troy Gentile, Kyla Pratt, Johnny Simmons, Lisa Kudrow, Kevin Dillon and Don Cheadle. It tells the story of two orphans, Andi and Bruce (played by Roberts and Austin), who attempt to hide their dog at an abandoned hotel after their strict new guardians tell them that pets are forbidden at their home. They also take in other dogs to avoid the dogs being taken away by cold hearted animal pound workers and police officers. The film is Nickelodeon's second film to be produced by DreamWorks Pictures after Lemony Snicket's A Series of Unfortunate Events and the first Nickelodeon film ever to be produced outside of Paramount Pictures, which still distributed the film for DreamWorks. Shooting began in November 2007 and filming took place entirely in the cities of Los Angeles and Universal City, California. The dogs in the film were trained for several months before shooting. Nearly 80 boys auditioned for the role of Bruce before Austin was ultimately selected. The film was released in the United States on January 16, 2009, and grossed approximately $17 million in its opening weekend in 3,271 theaters. Orphans Andi (Emma Roberts) and Bruce (Jake T. Austin) swindle a pawn shop owner in order to buy food to feed their dog, Friday. However, they are quickly caught and brought to the police station where they get picked up by social worker Bernie Wilkins (Don Cheadle) who takes them back to their foster parents, Lois and Carl Scudder (Lisa Kudrow and Kevin Dillon), who do not appear to care for either Andi or Bruce. Despite his sympathy for the two siblings, Bernie warns them that they are playing a dangerous game by deliberately getting into trouble in order to escape Carl and Lois. The next morning, Friday leaves to go looking for food, only to be caught by Animal Control. Desperate and worried, Andi and Bruce go into a local pet shop to ask if anybody has seen him. They meet Dave (Johnny Simmons) and Heather, (Kyla Pratt) who advise them to check the pound. They learn that Friday is indeed in the Pound but cannot be claimed without their parents present. While walking home, they discover a gang of youths committing a crime, causing them to flee before the police arrive. They look for Friday, who has already begun to hide in an abandoned hotel. They find a tiny Boston Terrier and an English Mastiff and name them Georgia and Lenny. Confident the three dogs will get along, Andi and Bruce leave Friday at the hotel for the night. The next day, Bruce stays at the hotel to keep the dogs quiet, while Andi heads to the same pet shop to get some food for the dogs, where she runs into Dave and Heather again. Andi lies to them that their parents often rescue dogs, causing Dave to ask her to take in three more dogs that nobody seems to want to adopt, which she reluctantly agrees. With six dogs to look after, the friends set about trying to get the hotel in a decent state to accommodate the dogs' needs, with help from a local boy named Mark (Troy Gentile), as they rescue more stray dogs to occupy the hotel. Eventually, Dave invites Andi to a party, which she agrees. Meanwhile, Bruce is caught stealing a hairdryer from Lois and is immediately interrogated by his foster parents. The party is ruined for Andi when she bumps into Jason, an old acquaintance who accidentally reveals to everyone that Andi is an orphan. Bruce manages to escape his house, only to find out that the hotel has fallen into chaos. Lois and Carl follow him, while the police are called, and the dogs are found and sent to the Pound, while Bruce and Andi are arrested by the police. When Lois and Carl refuse to take Andi and Bruce back, Bernie is forced to send them to separate foster homes. The dogs are all scheduled to be put down the next day, but Friday manages to escape captivity. He rushes over to find Dave, Heather, and Mark, who, in turn, find Andi and Bruce. Meanwhile, Bernie explores the hotel where he finds a dog named Harley, who had managed to avoid getting caught by animal control the previous night. Bernie then realizes why the kids loved doing what they did. Andi and Bruce manage to break into the Pound and release the dogs in an attempt to get them across the county line, where they will be safe. However, the dogs instead make their way back towards the hotel, believing it to be their real home. The strange event attracts the attention of citizens, reporters, and the police, who follow the dogs to the hotel, causing a large crowd to gather inside the hotel. Bernie appears and tells them how Bruce and Andi managed to create a family of dogs. He introduces all the dogs who live at the hotel and tells the stories of their past owners, which wins over the crowd, and the police allow the children to keep the dogs together. As people eagerly explore the hotel, Bernie reveals to an overjoyed Andi and Bruce that he and his wife have decided to adopt them. Sometime later, the hotel re-opens as a grand "Hotel For Dogs", where people can either adopt strays or board their dogs, while Andi, Bruce, and Friday happily settle into their new family. Jake T. Austin as Bruce, an orphan who, along with his older sister, Andi, has lived with a number of foster parents before ending up with Lois and Carl Scudder. He has a knack for mechanics. His inventions help keep the stray dogs living at the hotel fed and entertained while he and his sister are away. Nearly 80 boys tried out for the part before Austin was cast as Bruce. Emma Roberts as Andi, Bruce's older sister and later becomes Dave’s girlfriend. Roberts was cast in late 2007 and "knew as soon as soon as she started reading the script for Hotel for Dogs, she wanted to be part of the movie". Johnny Simmons as Dave, the young manager of a local pet store who helps Andi and Bruce rescue stray dogs and care for them at the hotel. Later, he becomes Andi's boyfriend and the new manager at the Hotel For Dogs. Troy Gentile as Mark, a young kid who lives near Andi and Bruce and is eager to help with the dogs at the hotel. Later, he becomes Heather's boyfriend. Kyla Pratt as Heather, an employee at the pet store who also wants to help rescue stray dogs and later, becomes the new guide at the Hotel For Dogs. Aswell as becoming Mark’s girlfriend. Pratt joined the film after she learned that Don Cheadle was also working on the project. She said in an interview that "they were telling me about all the different people who were gonna be in it, and I saw Don Cheadle's name, and I'm like, oh, absolutely". She also said of her co-star Emma Roberts that "Emma is so much fun to be around and she's hilarious. Emma's great because I wasn't sure how everything was going to be, because I was older than the other actors in the movie". Don Cheadle as Bernie Wilkins, a sympathetic social worker who tries his best to find a home for Andi and Bruce and to prevent them from being placed with separate foster families. Later, he becomes Andi and Bruce's adoptive father at the end. Cheadle joined the cast in September 2007. He described the film as "an opportunity to do a film that my kids can see" and praised both Emma Roberts and Jake T. Austin as being "really professional. They showed up to do the work and were serious and took it seriously and had acting coaches and everything". Robinne Lee as Carol Wilkins, Bernie's wife who initially tells her husband not to get too emotionally involved with the children he works with despite showing deep sympathy and care for them as well. Later, she becomes Andi and Bruce's adoptive mother. Lisa Kudrow as Lois Scudder, Andi and Bruce's controlling, wannabe rock star foster mother. Kudrow signed up for the film in October 2007. It was her first time working with dogs in a film. She said that her co-star Emma Roberts "was one of the draws for me to do this". Kevin Dillon as Carl Scudder, Andi and Bruce's foster father and an aging rocker who refuses to give up on his dreams of becoming a star. Dillon was cast in November 2007. Dillon said in an interview that singing and playing guitar during the band practice scenes was "one of the things that was the most fun" while filming. Yvette Nicole Brown as Ms. Camwell; was seen as either Mark's mom or boss. Gregory Sporleder as ACO Herb Dooley; the chief and boss of the animal pound workers, who stops at nothing to capture stray dogs, put them in cages, and then, have them put to sleep. Eric Edelstein as ACO Max; a morbidly obese, cruel, cold hearted animal pound worker, who along with his similar partner Jake, does everything in his power to lock up every stray dog in the city, even Andi and Bruce's own dog, Friday. Ajay Naidu as ACO Jake; a cruel, cold hearted animal worker, like his partner Max, who does everything in his power to lock up and put down every stray dog they find and capture in the city. Maximiliano Hernández as Officer Mike; a strict, yet caring, police officer, who along with his partner Jeff, has been keeping an eye on Andi and Bruce since the time they ripped a pawn shop owner off. At the end, he allows Andi and Bruce to keep the dogs. Andre Ware as Officer Jeff; Officer Mike's similar partner who has been keeping an eye on Andi and Bruce since the time they ripped a pawn shop owner off. At the end, he allows Andi and Bruce to keep the dogs as well. Jonathan Klein as Evan; a pawn shop owner whom Andi ripped off by selling him a rock in a phone box for twenty-seven dollars at the beginning. Kenny Vibert as Jason; an old acquaintance of Andi and Bruce, who accidentally notifies everyone that Andi is an orphan living with the Scudders in the same building his grandmother lives in at the party. Cosmo the Dog as Friday, Andi and Bruce's pet dog. He is a Jack Russell Terrier. It's basically these unwanted children, these unwanted animals coming together and making their own place in their own home. That's what I liked. It wasn't the fact that it was Fox Terriers and things like that. So that sort of made me sign on and be ready for it. A producer of the film, Lauren Shuler Donner, is also an activist and dog lover, and was convinced that the book's message about the importance of family "made the novel an ideal property to bring to the big screen" Shuler Donner insisted that the movie "stand out from other family movies visually" and it was Freudenthal's background in animation that gave him an edge over other directors. According to her, "It was the way he framed shots, the way he moved the camera, the use of color, the use of light. He's very visually savvy and very specific." Emma Roberts was cast in August 2007 to play teenage older sister Andi. Freudenthal began his search for a young actress "who could carry a whole movie" and settled on then-16 year old Roberts. Ewan Leslie, a producer of the film, said in an interview of Roberts that she "is one of those young actors whose face just lights up the screen and she has the ability to play a wide range of emotions without any dialogue." Filmmakers conducted a nationwide search for an actor to play Bruce, Andi's whimsical and inventive younger brother. Jake T. Austin auditioned late, after nearly 80 other boys had tried out for the part. Jason Clark, another producer of the film, stated that Austin "was amazing on every level. He played the emotional beats very well, felt the role and also understood timing." The rest of the roles were cast in the following months. Don Cheadle, who plays Andi and Bruce's protective social worker, joined the film in September 2007. Lisa Kudrow was cast as the siblings' foster mother in October, and Johnny Simmons was cast that same month as Dave. Kyla Pratt was chosen to play Heather soon after. The dogs were carefully cast as well. Filmmakers wanted a variety of breeds with different colors and facial structures "so that their look suggested their personality." Freudenthal said that he deliberately chose both very small and very large dogs to create a contrast similar to the characters of Lenny and George in the John Steinbeck novella Of Mice And Men. The majority of the dogs cast were rescues. The lead dog, who plays Friday, was rescued about six months before shooting began. Crew members also helped to find adoptive homes for the abandoned dogs and several adopted dogs themselves. A Hollywood animal trainer, Mark Forbes, was hired to prepare the dogs before shooting began. Forbes and his team began working with the dogs about four months before shooting. Those dogs with no prior training were first taught basic commands, such as "sit" and "roll over." They were then trained to respond to more complex commands and learned to retrieve objects and to wave. The dogs sit in replicas of cars surrounded by fans that simulate driving on a highway with the wind blowing. The next phase of training involved using the dogs' body language to express emotions: sadness, for example, was conveyed when a dog tucked its tail between its legs. Finally, the dogs were taken to public places to review the commands that they had learned. The purpose of this was to ensure that the dogs would perform in any location. According to Forbes, "You want the dogs to sense that everything is fine and they'll still get their treat regardless of the location. The set becomes just another place for them to go." The trainers worked with the human actors as well to "familiarize them with how the dogs behave and create a comfort level between the human and the dog actors." 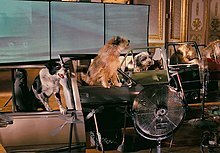 The dogs were also trained to interact with the various gadgets in the film with early prototypes built by the special effects team. Special effects supervisor Michael Lantieri enlisted to create the various contraptions invented by Bruce throughout the film to keep the dogs fed. One such gadget is a device which can be operated by the dogs to throw a ball to be fetched. Other devices built for the film include a feeding machine that drops food into each of the dogs' bowls on a timed schedule, a vending machine filled with shoes and other chew toys, a room filled with doors whose doorbells go off on their own, and another containing a replica of a car surrounded by fans which simulates for the dogs the experience of placing their heads through an open car window while driving. All of the contraptions were created using objects that might actually be found in an abandoned hotel, and in such a way that they looked like they had been created by a gifted 13-year-old boy. Hotel for Dogs was released in Puerto Rico on January 15, 2009, and in the United States on January 16, 2009, to 3,271 theaters. It earned $17,012,212 in its opening weekend, the 5th-highest-grossing film of that weekend behind Paul Blart: Mall Cop, Gran Torino, and others. It remained in release for 19 weeks and earned a total of $116,983,275 worldwide. It is estimated to have earned $22,500,000 total over the four-day weekend. Moviefone called the opening, "pretty good for a fairly anonymous little family film opening against a higher-profile family film." As of August 2011, the film has a reported box office gross of $73 million for the United States and $44 million internationally, for a total of $117 million. On Metacritic, the film received a score of 51 out of 100, based on 25 reviews, indicating "mixed or average reviews". According to Rotten Tomatoes, a website which aggregates film reviews, 46% of critics gave Hotel for Dogs a positive review; the site's consensus further stated: "Hotel for Dogs may appeal to children and dog lovers, but it's ultimately contrived, predictable and simplistic". Roger Ebert gave the film a 2.5 out of 4 stars and summed up his review by saying, "What I thought instead was, Marley has a lot he could learn from these dogs". Kent Turner, writing for School Library Journal, stated that while the book is "utterly realistic", the film is "fantastic" and thus fundamentally different. Stephen Holden, writing for The New York Times, wrote that the film "is loaded with enough stupid pet and human tricks to satisfy David Letterman for years to come". It tied with Up for Best Feature Film at the 24th Genesis Awards. A video game based on the film was released on January 13, 2009 for Microsoft Windows, Wii, and Nintendo DS and published by 505 Games. The film was released on DVD on April 28, 2009. It sold 773,000 units in the first week, bringing in $13,584,527 in revenue. As per the latest figures, 1,778,736 DVD units have been sold, translating to more than $30 million in revenue. This does not include Blu-ray sales. The film was re-released on DVD on January 24, 2017. The score to Hotel for Dogs was composed by John Debney, who recorded his score at the Eastwood Scoring Stage at Warner Brothers. ^ a b c d e f "Hotel for Dogs (2009)". AFI Catalog of Feature Films. Retrieved September 19, 2017. ^ "Filming locations for Hotel for Dogs". IMDb. Retrieved 2010-01-02. ^ "Trivia for Hotel for Dogs". IMDb. Retrieved 2010-01-02. ^ Bentley, Rick (January 15, 2009). "Emma Roberts checks into Hotel for Dogs". The Star. Malaysia. Retrieved 2010-01-02. ^ "TheStarScoop.com: Interview With Kyla Pratt". TheStarScoop.com. Retrieved 2010-01-02. ^ "Cheadle to star in 'Hotel for Dogs'". UPI. September 11, 2007. Retrieved 2010-01-02. ^ Wilson Morales (January 13, 2009). "An Interview with Don Cheadle". BlackFilm.com. Retrieved 2010-01-02. ^ "Kudrow checks in to 'Hotel for Dogs'". TheMoneyTimes.com. Retrieved 2010-01-02. ^ "Lisa Kudrow Interview". Buzzine. Archived from the original on 2009-01-29. Retrieved 2010-01-02. ^ "Kevin Dillon checks in "Hotel for Dogs"". Monsters and Critics. Archived from the original on 2012-03-06. Retrieved 2010-01-02. ^ Kevin Dillon. Hotel for Dogs Interview - Kevin Dillon. Trailer Addict. Event occurs at 00:24. Retrieved 2010-01-02. ^ a b c d e f g h i j k "Hotel for dogs film production notes" (.doc). Cinematic Intelligence Agency. Retrieved 2010-01-02. ^ "Hotel For Dogs Picked Up By DreamWorks". insomniacmania.com. Archived from the original on 2008-01-13. Retrieved 2010-01-02. ^ a b "Freudenthal Interview, Hotel For Dogs". MoviesOnline. Retrieved 2010-01-02. ^ a b boxofficemojo.com, "Hotel for Dogs". Accessed 14 August 2011. 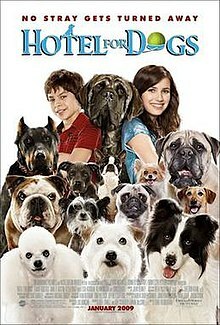 ^ "Hotel for Dogs (2009) - Box Office Mojo". Box Office Mojo. Retrieved 2010-01-02. ^ Novikov, Eugene (2009-01-20). "Weekend Box Office: 'Mall Cop' Cleans Up". Cinematical. Retrieved 2009-07-20. ^ "Hotel for Dogs Reviews - Metacritic". Metacritic. Retrieved 2017-02-18. ^ "Hotel for Dogs Movie Reviews". Rotten Tomatoes. Retrieved 2015-03-29. ^ Turner, Kent (2009-01-14). "Hotel for Dogs". School Library Journal. Reed Business Information. Archived from the original on 2009-07-27. Retrieved 2009-07-19. ^ Holden, Stephen (2009-01-16). "A Tale of Love and Liberation (Puppy and Otherwise)". New York Times. Retrieved 2015-03-29. ^ "Hotel For Dogs Video Game Now Available At Retail". IGN. 2009-01-13. Retrieved 2018-10-06. ^ Dan Goldwasser (2008-09-04). "John Debney scores Hotel for Dogs". ScoringSessions.com. Retrieved 2008-09-16. This page was last edited on 23 March 2019, at 21:34 (UTC).